I stumbled across the following toy line through eBay. 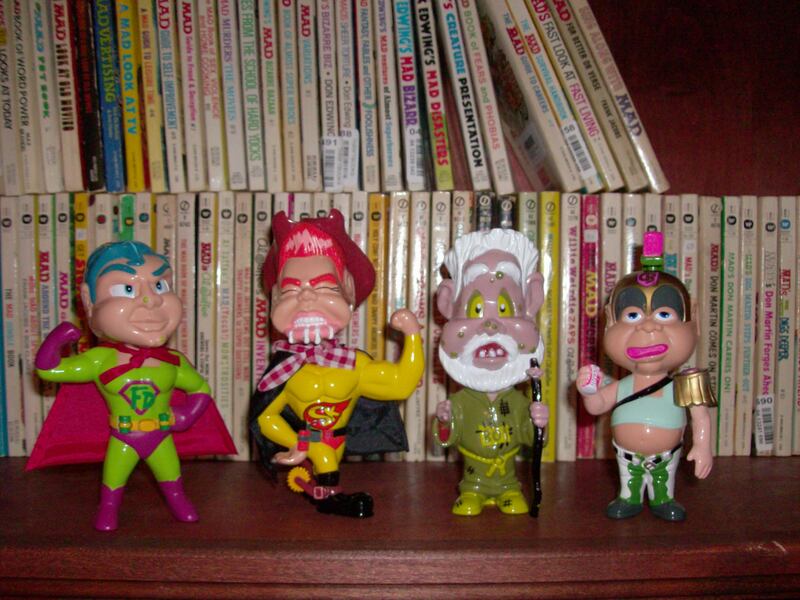 Evidently, there was a set of toys produced by a Canadian company called “Wow Wee Inc.” in 1997 called “Spew Crew”. There is very little information on these online, and there seems to be only one person who managed to get their hands on these: the eBay seller, who is himself in Canada. The packaging for the series claims that there were 6 different toys in the line, but the eBay seller only has four of them–and he appears to have tons of them. I’ve purchased two of each of the four available, and the seller has more! Perhaps he used to work for the company, or purchased a bulk lot when Wow Wee closed up shop? I’m a little afraid to ask any eBay seller a ton of questions at once. If anybody out there knows anything about this line, feel free to contribute in the comments. Anyways, the toys themselves. 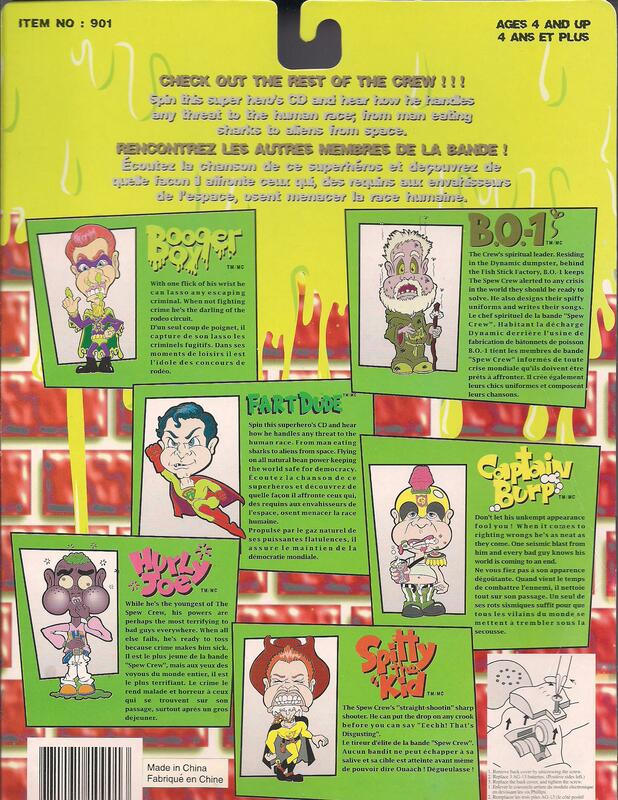 Up top, in the photograph, are “Fart Dude”, “Spitty the Kid”, “B.O.-1”, and “Captain Burp”. The tallest of these, Spitty, measures 6″ tall. They’re hard plastic; Spitty and Fart Dude have little capes as well. The capes, by the way, remind me of the 80s line “Gross Out Gang”. Each of these has at least one sound, which are activated by buttons on the front of their belts (the speakers are on the backs of their heads). 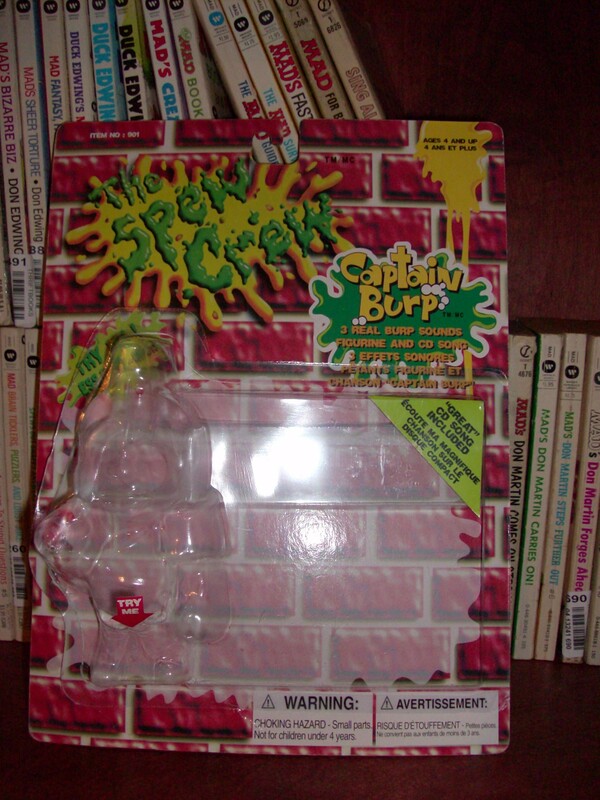 Fart Dude and Captain Burp have three buttons each. (The French text on the card fronts for the other two claim 3 sounds, but the English text does not–probably just an editorial oversight.) None of these figures are articulated. Captain Burp’s arms look like they should move, but either due to the stiffness of the joints, or the construction of the figure, I can’t get them to move. This is one of those toylines where I get the impression that more than one person designed the figures. B.O.-1’s head makes him look like he’s from an entirely different line. He’s also the most specific of the Spew Crew; it took me a few minutes to figure it out, but I think it’s safe to say he’s a parody of Obi-Wan Kenobi. Perhaps he was meant for a ditched line of gross Star Wars parody toys? As you’ll see in the above image, these came packaged with CDs. Each character has a different CD with a song about the character. The CDs are why I bought two of each of these four figures–the archivist in me was torn between preserving unopened copies and preserving copies of the songs on the CDs. Luckily, despite the age (roughly 18 years at this point), and what I imagine must have been the cheap-ish production quality of these CDs, I was able to rip good copies of each of the four songs. So here you go–songs from the Spew Crew! Again, if anyone has any additional light they can shed on the Spew Crew, please let the rest of us know in the comments! P.S. Spitty the Kid is my favorite. This entry was posted on 2015/02/13 at 6:43 PM and is filed under Toys You've Never Heard Of. You can follow any responses to this entry through the RSS 2.0 feed. You can leave a response, or trackback from your own site. I`m hoping to find the other 2 but it`s like finding a 50 ct diamond very rare to find.